Paul Eugene Jappe was born January 16, 1898 in Union Hill, which later became part of Union City. Swift, sure-handed, wiry and tough, Paul was drawn to football and became a star player at Commercial High School after his family moved to Brooklyn. Paul enrolled at Syracuse University in 1920, where he played for Chick Meehan, who was just beginning his illustrious coaching career. Paul also rowed crew for the Orangemen. 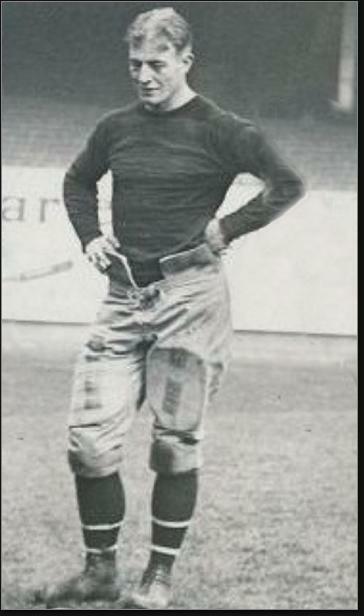 Paul played three season of varsity football for the Orangemen between 1921 and 1923, as a guard and end. The team played an independent schedule and was one of the powerhouse schools in Eastern football. The 1923 squad went 8–1, defeating Alabama, Pitt, Penn State and Nebraska—and allowed just two touchdowns all year. Paul was rated among the nation’s top ends in 1922 and 1923, just missing All-America recognition in 1922 but earning All-Eastern honors. After college, Paul returned to Brooklyn. In 1925, Paul signed for $75 a game to play as a two-way end with Tim Mara’s newly formed Giants. He wore numbers 22 and 17 during his Giants career. Paul scored a touchdown in the Giants’ first game, and exhibition contest against an All-Star team in New Britain, Connecticut. Paul was one of five former Orangemen on the 1925 roster, including Doc Alexander (an All-American for Syracuse in 1918 and 1919 and future Hall of Famer), Jim Frugone (also a teammate at Commercial High), Tommy Tomlin and Jack McBride. The Giants went 8–4 in their inaugural season, and won 3 of 5 exhibition games—including two contests in Florida. Paul never forgot how good it felt in the Sunshine State in January. The following season, Paul played for another expansion NFL team, the Brooklyn Lions, who were formed to oppose the Brooklyn franchise in the short-lived American Football League. The Lions played their home game in Ebbets Field. Near the end of the season, the AFL team suspended play and it merged with the Lions. Paul returned to the Giants and spent the season as a reserve. He saw action in all 13 games as the Giants dropped just one contest—to the Cleveland Bulldogs—and finished the year 11–1–1. Their 11 victories were 4 better than the second-place Green Bay Packers, which earned New York its first NFL championship. The Giants allowed just three touchdowns all season. The Giants tumbled into the second division in 1928, managing a mere 4 wins. Paul moved from end to guard for the season, starting 7 games after playing 5 as a substitute. That was Paul’s final season as a pro. At age 30, it was time to hang up his spikes. Paul moved to Florida later in his life. He passed away at the age of 91 in Daytona Beach.